Here how to use the template. 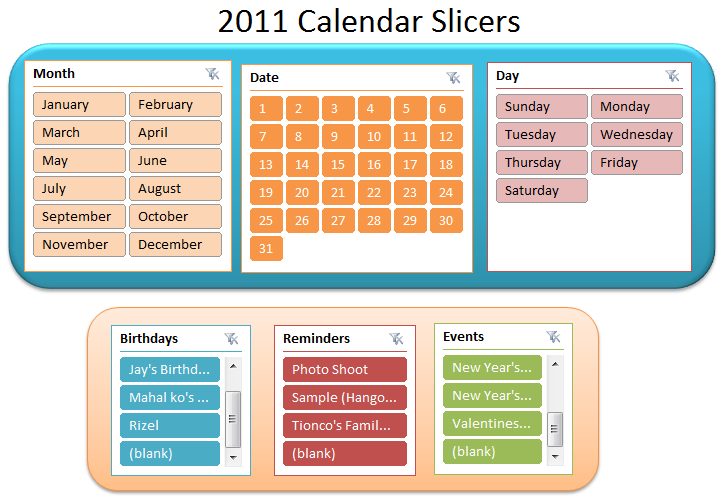 Note: The Slicer feature is only available in Excel 2010 and this template will be maximized using the said version. This entry was posted on Thursday, December 30th, 2010 at 7:41 pm	and posted in Excel, New Features. You can follow any responses to this entry through the RSS 2.0 feed. Hi found your slicer calendar in Excel really useful, but was wondering how you managed to get the slicer display the months and days only as a single set?